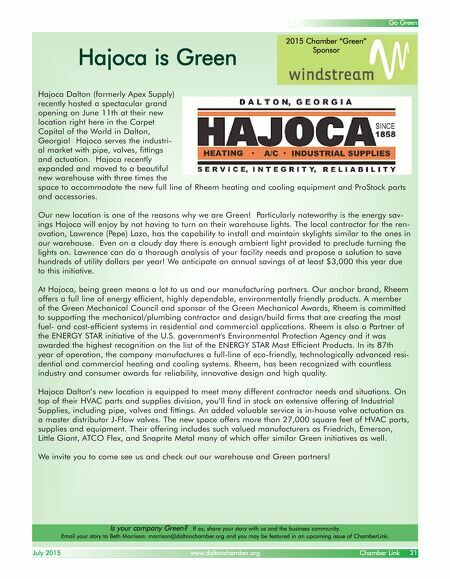 July 2015 www.daltonchamber.org Chamber Link 21 Go Green 2015 Chamber "Green" Sponsor Hajoca Dalton (formerly Apex Supply) recently hosted a spectacular grand opening on June 11th at their new location right here in the Carpet Capital of the World in Dalton, Georgia! Hajoca serves the industri- al market with pipe, valves, fittings and actuation. Hajoca recently expanded and moved to a beautiful new warehouse with three times the space to accommodate the new full line of Rheem heating and cooling equipment and ProStock parts and accessories. Our new location is one of the reasons why we are Green! Particularly noteworthy is the energy sav- ings Hajoca will enjoy by not having to turn on their warehouse lights. The local contractor for the ren- ovation, Lawrence (Pepe) Lazo, has the capability to install and maintain skylights similar to the ones in our warehouse. Even on a cloudy day there is enough ambient light provided to preclude turning the lights on. Lawrence can do a thorough analysis of your facility needs and propose a solution to save hundreds of utility dollars per year! We anticipate an annual savings of at least $3,000 this year due to this initiative. At Hajoca, being green means a lot to us and our manufacturing partners. Our anchor brand, Rheem offers a full line of energy efficient, highly dependable, environmentally friendly products. A member of the Green Mechanical Council and sponsor of the Green Mechanical Awards, Rheem is committed to supporting the mechanical/plumbing contractor and design/build firms that are creating the most fuel- and cost-efficient systems in residential and commercial applications. Rheem is also a Partner of the ENERGY STAR initiative of the U.S. government's Environmental Protection Agency and it was awarded the highest recognition on the list of the ENERGY STAR Most Efficient Products. In its 87th year of operation, the company manufactures a full-line of eco-friendly, technologically advanced resi- dential and commercial heating and cooling systems. Rheem, has been recognized with countless industry and consumer awards for reliability, innovative design and high quality. Hajoca Dalton's new location is equipped to meet many different contractor needs and situations. On top of their HVAC parts and supplies division, you'll find in stock an extensive offering of Industrial Supplies, including pipe, valves and fittings. An added valuable service is in-house valve actuation as a master distributor J-Flow valves. The new space offers more than 27,000 square feet of HVAC parts, supplies and equipment. Their offering includes such valued manufacturers as Friedrich, Emerson, Little Giant, ATCO Flex, and Snaprite Metal many of which offer similar Green initiatives as well. We invite you to come see us and check out our warehouse and Green partners! Hajoca is Green Is your company Green? If so, share your story with us and the business community. 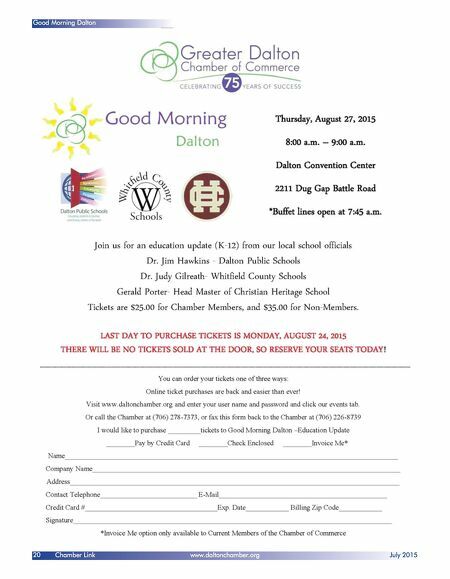 Email your story to Beth Morrison: morrison@daltonchamber.org and you may be featured in an upcoming issue of ChamberLink.